The Italian shipbuilding group Fincantieri showcased the Qatar Emiri Naval Forces’ (QENF) forthcoming multi-mission/air defence-capable corvettes, offshore patrol vessels (OPV) and land platform dock (LPD) at the 2018 Doha International Maritime Defence Exhibition and Conference (DIMDEX). Qatar inked a $5.9 billion US contract with Fincantieri in August 2017 for four corvettes, two OPVs and a LPD along with MBDA to supply the various armaments of the new generation warships. Navy Recognition reports that the steel-cutting of the lead ship will commence in June 2018, with delivery scheduled for 2021. The corvettes, along with the OPVs and LPD, will be built in Italy. 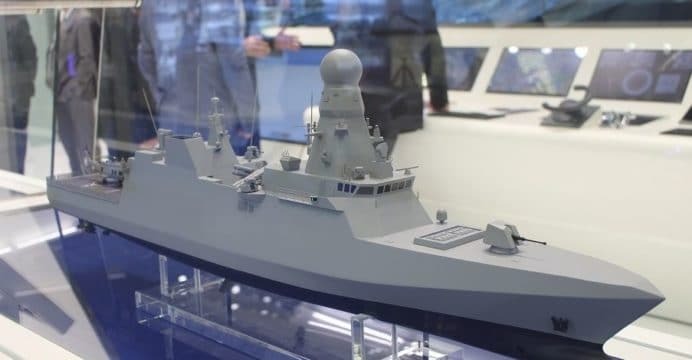 Interestingly, although the QENF’s LPD is a variant of Algeria’s Kalaat Béni Abbès, it will be equipped with the Leonardo KRONOS radar and MBDA Aster 30 long-range SAM. In effect, the QENF LPD will serve as a dual-amphibious and area air defence ship, a unique combination. The LPD’s helicopter force, which will include the NH90 – for which Qatar signed a $3.7 billion US deal for 28 helicopters – will offer a measure of anti-ship warfare (AShW) capability through the MBDA Marte ER. Like its air force and army, Qatar’s naval development plans are on the path of both recapitalization (i.e. replacing old ships) and expansion (i.e. increasing quantity, introducing new qualitative capabilities, etc). In terms of its naval requirements, the QENF has evidently incorporated air defence as an integral aspect, be it to protect its other ships or to ensure that Qatar’s offshore assets (e.g. gas rigs) are protected from airborne threats. Interestingly, there is an apparent emphasis on real and perceived aerial threats which may be driving Qatar’s expansive procurement of multi-role fighter aircraft. It will be interesting to see how much of this is intended to force a total denial and access of Qatai territory and control of offshore economic assets, especially in lieu of human resources and territorial depth. This would not explain the desire of many different types of similar aircraft, but it could reflect the overarching push for expanding numbers by many multiples, especially of air and naval assets.